This is a new regular feature in which we'll take a look at recent sneaker releases. Over the summer, Timberwolves center Kevin Love ended his short-lived deal with the Chinese sportswear company PEAK. With PEAK, Love had released a sneaker made especially for the 2011 All-Star Game. It had the number 42 on the tongue and a heart on the heel. The heart stood for Love, and the red, of which there is plenty, stood for the West. PEAK and Love called the shoe "Relentless," which, I'm sure, was at one point pitched for the name of Atlanta's WNBA expansion team (they went with "Dream" instead). But there was some logic to the name, right? Love is, after all, relentless on the boards. He averages 15 rebounds a game. He once had 31 in a single game. Relentless! Red! Intensity! You get the idea. 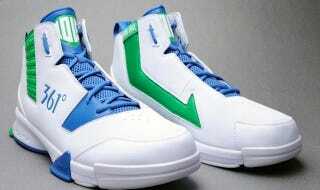 Over the summer, however, Love left PEAK and joined up with a different Chinese sneaker company. This one is called 361; as in 361°; as in a single degree more than a 360°, which is actually a relevant figure in basketball. The company says that it represents athletes with "one extra degree of passion" in their respective sports. So while all other basketball players are simply going 360° in their play, Kevin Love goes that extra degree. He goes a single degree more. If you're going to go beyond 360°, why not go to 540°, or even maybe 720°? Why stop at 361°? Are there not more impressive degrees to be reached? Can we not think beyond 361°? 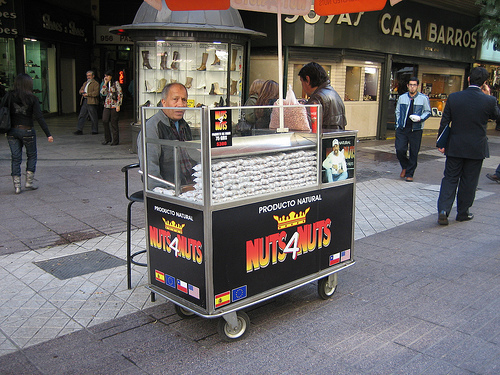 Another theory: In Chile, and possibly in other South American countries, there are nut carts with the exact same logo as Manhattan's "NUTS 4 NUTS" nut carts, only in Chile, the "4" is replaced with a "5." 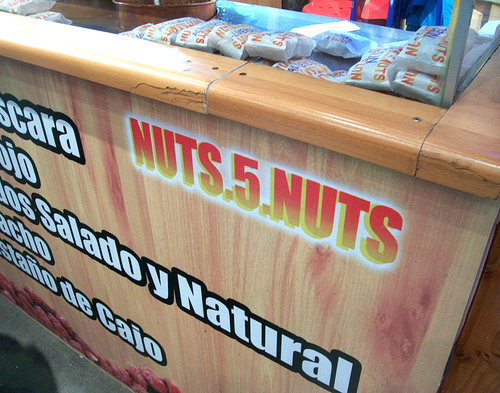 This is done in part to protect Chilean nut vendors from lawsuits, and in part because at least initially, Chileans probably did not understand that "4" could also signify 4 the English word "for." Thus, everyone was Nuts 5 Nuts. So I considered, for a moment, that this could have been another lost-in-translation situation for foreign branding. But the degree system is fairly universal. So really, this is only about that extra degree. And then there is the shoe itself. Kevin Love's 361° is blue and green, because of the Minnesota Timberwolves, and it says "LOVE" on the tongue and "KEVIN LOVE" on the inner ankle, which effectively renders this thing unmarketable, because who really wants a Kevin Love shoe, anyway. There is also a swoosh-like shape on the inner seam, which is kind of like putting a half-eaten orange on the frame of a Dell desktop. The real wonder of the 361°, though, is the assortment of Random Rubber Or Plastic Accoutrement, which shall be known as RROPA. Love's shoe has four separate pieces of abject RROPA: the bar labeled "Arch," which goes under your arch (your arches are happier if their supports are labeled, you see); the "NFO" bubbles, which I presume are supposed to help you jump and get that extra degree; the unlabeled green lips sticking out of the heel, which are clearly pointless because they are not labeled; and the "SideBack" on the outer lip, which I can only guess is intended to help one travel from one side of the court, and back again. An educated guess: Kevin Love's ability to go the extra 1° has very little do with a tiny piece of rubber called the SideBack and even less to do with NFO bubbles. (Everyone knows you need at least four NFO bubbles for maximum NFO-ability.) Kevin Love's ability to go the extra 1° probably has much more to do with his losing 20 pounds, which he already did. And then there is the 361° logo itself. This is not a logo; it is three typed numbers and a degree symbol placed at a slant on the side of an ugly shoe. I am, in fact, pretty sure that when I was working at Sports Illustrated Kids, this logo was on one of the submissions in the Most Awesome B-Ball Shoe Design Contest! contest, and it was submitted by a 10-year-old from Iowa named Holly. I haven't seen a price yet on this shoe, and Sole Collector reports that there isn't any official word on when it might hit Chinese retail stores, so we, and the Chinese, can't yet try them out. For now, we only have the image to appease us, and the sudden, inexplicable inspiration to go that extra degree. Which I actually just did, as I was typing this, by turning my swivel chair 1° to the right.